George Orwell, Homage to Catalonia (1938). Last year marked the 75th anniversary of the publication of George Orwell’s Homage to Catalonia. 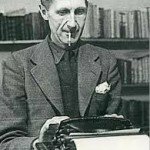 Adam Hochschild’s essay, “Orwell: Homage to the ‘Homage’,” New York Review of Books, Dec. 19, 2013, can be found at http://www.nybooks.com/articles/archives/2013/dec/19/george-orwell-homage/?insrc=toc. Below is a slightly updated version of my decade-old reading of Orwell’s Homage. Though we’re just a tad tardy in noting this anniversary, remembering Orwell on the day of the opening of the winter Olympics in Russia seems appropriate enough. Each of us who reads has a list of landmark books –“landmarks” in the sense of defining moments in our own intellectual and emotional development. 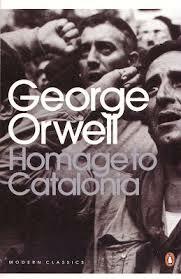 One such book on my list is George Orwell’s memoir of the Spanish Civil War, Homage to Catalonia (1938). I can’t remember exactly when I first read it, but I’m pretty sure that it was sometime after I had actually seen the city of Barcelona, Spain, the capital of Catalonia, which I visited in 1959 as an 18-year-old sailor in the U.S. Navy, and which is where Orwell’s book opens in late 1936. I still recall being both excited and charmed by Barcelona’s beauty, by its broad main boulevard, the Ramblas, and its continental cafes. I noticed the ubiquitous presence of its Civil Guard police, with their guns and distinctive black matador-style headgear, but I had only the fuzziest notion of who the country’s ruler, General Francisco Franco, really was. Reading Orwell’s book about Spain was integral to my political education. In the centenary year of Orwell’s birth, I re-read Homage to Catalonia–as it happens, during the American punitive expedition to Iraq in April 2003. Though I encountered Orwell’s book about a quarter-century after it had first been published, its concerns were still relevant then, the early years of the Cold War, and re-reading it some 65 years after its original and obscure publication, the book remains a powerful literary experience. More important, its dark vision, what I’ll be calling “Orwell’s nightmare,” still seems to me germane to our situation today. 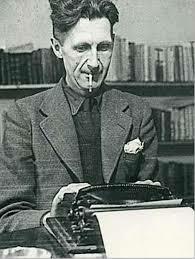 Orwell is one of those writers who makes the rest of us feel self-conscious about writing. In his renowned 1945 essay, “Politics and the English Language,” and his equally famous dictum, “Good prose is like a window pane,” Orwell argues for transparency and a plain style. Most of what he says about the relation of language to politics is true but, as many dissenting critics have pointed out, good prose is not necessarily, or at all times, like a window pane, and the plain style can become a guise that merely gives the impression of transparency. What makes Orwell’s prose powerful is not simply an uncluttered style, but Orwell’s intelligence. Orwell’s more than half-century-old essay on writing in relation to politics has continued to influence and provoke writers. The experience of the Spanish War and then writing about it in “white-hot anger” was the turning point of Orwell’s life. As Orwell says in his 1946 essay, “Why I Write,” “The Spanish War and other events in 1936-37 turned the scale and thereafter I knew where I stood. Every line of serious work I have written since 1936 has been written, directly or indirectly, against totalitarianism and for democratic Socialism, as I understand it. It seems to me nonsense… to think one can avoid writing of such subjects. Everyone writes of them in one guise or another… The more one is conscious of one’s political bias, the more chance one has of acting politically without sacrificing one’s aesthetic and intellectual integrity… What I have most wanted to do throughout the past ten years is to make political writing into an art.” Finally, Orwell matters because of what I call “Orwell’s Nightmare,” which I’ll address momentarily. For those who don’t know, or have forgotten, the details of the Spanish Civil War and Orwell’s experiences there, it may be helpful to recall that the war began in mid-1936. It was a rebellion against the elected left-of-centre Republican government by the right-wing General Francisco Franco, who was supported by the fascist governments of Germany and Italy. 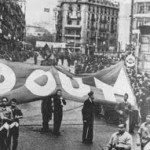 The Spanish Loyalists, as partisans of the government were also known, received support from the Soviet Union while, notably, England and France stood aside, part of their “appeasement” of the fascist regimes. 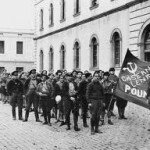 The Spanish Civil War had an enormous impact on all of Europe. It was not only the prelude to World War II, but as the continent’s ideological battleground, it shaped the minds of an entire generation. Orwell went to Barcelona in late 1936, ostensibly as a journalist, but promptly signed up with one of the Marxist militias, POUM (Partido Obrero de Unificacion Marxista), and served on the front lines for several months. He arrived in Spain admittedly naïve about the internecine political factions that made up the Loyalist forces and, semi-inadvertently, volunteered for a group that is sometimes described as Trotskyist, and that was also politically close to the Spanish Anarchists. 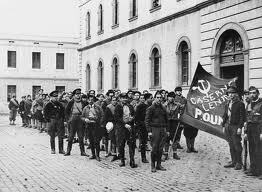 POUM would shortly be singled out as an enemy of the revolution and eventually destroyed by order of the Spanish Communist Party, which was, to a large extent, controlled by the Communist Party of the Soviet Union. At the time, the Soviet Union was under the dictatorship of Josef Stalin and was in the midst of its own hideous infra-party struggle, highlighted by a series of trumped up Purge Trials allegedly intended to rid the ruling party of the influence of Leon Trotsky, a prominent figure in the 1917 Russian Revolution. Trotsky, once an ally of Stalin, became his rival in the struggle for succession after the death of V.I. Lenin, the revolution’s leader. Stalin forced Trotsky into exile and eventually had him assassinated. 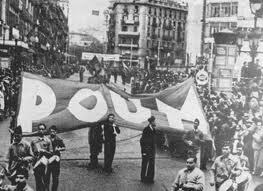 Meanwhile, Orwell, while on leave from the front, witnessed and semi-participated in a sort of civil war within the Civil War that broke out among leftist factions in Barcelona in May 1937. He went back to the front a few days later, was seriously wounded at the end of May–shot in the throat by a sniper–and returned to Barcelona to recuperate, but was forced to flee Spain less than a month later, a step ahead of the police, wanted because of his political association with POUM, which had been outlawed by the Republican government. Hundreds or even thousands of POUM’s adherents were arrested, jailed and, in many cases, executed. Orwell had been in Spain, altogether, 6 or 7 months. Much of the Spanish Civil War itself can be described metaphorically as a nightmare. Among the disasters: first, the Fascists won the war and Franco ruled Spain until his death in 1975; second, the European democracies, principally England and France, abstained from the war, partially on the grounds that the elected Spanish Republic was or would become “Red,” and thus they paved the way for a more extensive world war than might otherwise have happened if they had opposed fascism earlier. Third, the Soviet Union indirectly participated in the war, with dubious consequences that are still argued about today, but did not succeed in forestalling Spanish, Italian or German fascism. Thus, fourth, the possibility, if there was one, of a genuinely democratic Spanish revolution was gutted. Fifth, and perhaps most painfully for the sense of betrayal it produced among combatants like Orwell, the dominance of the Communist Party among the forces of the Spanish Left precipitated a truly nightmarish liquidation of other leftist groups, complete with false accusations of collaboration with the enemy, imprisonment, torture, and execution. All of this was accompanied, as a writer of Orwell’s linguistic sensitivities was aware, by a horrible mangling of language that emptied it of meaning. Finally, the conduct of the war, as Orwell’s account makes plain, was itself a nightmare of battlefield suffering, inadequately armed or trained troops, failed tactics, and all the discomforts, boredom and horrors of deadly war. In June 1937, Orwell returned to England, a place where it was hard “to believe that anything is really happening anywhere.” As he says in the bucolic but ominous concluding passage of Homage to Catalonia: “Down here it was still the England I had known in my childhood: the railway-cuttings smothered in wild flowers, the deep meadows where the great shining horses browse and meditate… and then the huge peaceful wilderness of outer London, the barges on the miry river, the familiar streets, the posters telling of cricket matches and Royal weddings, the men in bowler hats, the pigeons in Trafalgar Square, the red buses, the blue policemen–all sleeping the deep, deep sleep of England, from which I sometimes fear we shall never wake till we are jerked out of it by the roar of bombs.” The bombs prophecied by Orwell would come soon enough. Immediately upon his return, Orwell set to work, writing a torrent of articles, letters, reviews of new books about the Spanish War, and the manuscript that would be Homage to Catalonia. His first piece, “Spilling the Spanish Beans,” published at the end of July 1937, which begins with Orwell assessing blame for the state of British ignorance about the war, dubiously declares, “I honestly doubt… whether it is the pro-Fascist newspapers that have done the most harm. It is the left-wing papers [especially the Communist Party paper, the Daily Worker]… with their far subtler methods of distortion that have prevented the British public from grasping the real nature of the struggle.” The claim is dubious insofar as the left-wing papers had a limited circulation. Orwell means not the “British public” but the British Left. Orwell wasn’t right in his tendency to conflate Fascism and capitalism, a view that echoed the Communist line through much of the 1930s. This is among the few murky areas in Orwell’s thinking, but some of the confusion can be atrributed to Orwell’s two-pronged program to write against totalitarianism and for democratic socialism. Was Orwell right in adhering to POUM’s view that the war and revolution were inseparable? I don’t think we’ll ever know. The opportunity, if it was one, was irreparably lost. It’s worth noting that the prominent Spanish Civil War historian, Hugh Thomas, who thought Orwell’s book the best firsthand account of the Spanish Civil War, also thought Orwell was wrong about tactics. According to Thomas, “If the Republicans were to have a hope of winning the civil war, the only policy was to centralize war production, delay the revolutionary process (to avoid antagonizing the peasants), [and] establish a regular army in place of the militias… The anarchists and the POUM, through greater idealism, were unable to swallow such realistic stuff…” But even if the Communists were right about tactics, there’s not much evidence that it was necessary to suppress POUM and other groups. On the whole, I think Orwell was right, or right enough, on the great political issues of his time, even though he may not have known what to do about all of them, any more than we do now, as we debate the politics of terrorism, “humanitarian intervention,” the path of empire, and what to do about greater and lesser evils. More important than being right, Orwell’s great essays, and books, principally Homage to Catalonia, Animal Farm, and 1984, are still right for us as readers and citizens. Certainly, that wasn’t immediately apparent upon the publication of Homage to Catalonia. It was printed in an edition of 1500 copies in early 1938 by the British firm, Secker and Warburg. By the time of Orwell’s death in 1950 it had sold a mere 600 copies which, if nothing else, ought to hearten other under-appreciated authors. Though Orwell had achieved fame and sufficient means by the end of his life–both Animal Farm and 1984 were best-sellers–Homage to Catalonia found a readership only after Orwell’s death. Of course, now we know that the nightmare Orwell contemplates in “Looking Back on the Spanish War” is precisely the subject matter he would address in his last novel, 1984. The daily occupation of his protagonist in that book, Winston Smith, is the perpetual false re-writing of the past, and one of Orwell’s greatest literary creations, the character O’Brien, tortures Smith into believing, at least briefly, that two plus two are five. While Garton Ash’s reasons for reading Orwell today are true enough, my own view is that Orwell still matters because his nightmare about the erasure of the past continues to be relevant. It is true that the terms of the present political engagement may have changed. A popular expression of those changing terms is found in the title of Benjamin Barber’s Jihad vs. McWorld. While Soviet totalitarianism is gone (but not, apparently, Russian authoritarianism in Vladimir Putin’s regime) we now find ourselves describing a world of insatiable consumers in the capitalist mall and a realm of bloodthirsty tribalists and religious fundamentalists possessed of a feudal metaphysics, both of which, Barber argues, are threats to democracy no less than the version of totalitarianism that Orwell depicted. Even in Orwell’s time, there were alternative versions of the nightmare. This is not the place to argue the dimensions of the present dangers. It is enough to note that whether we’re talking about our young people hanging out in the mall, engrossed in the virtual destruction provided by video games, or their young people indoctrinated in fundamentalist schools and sometimes persuaded to engage in the self-and-other-destruction of suicide bombing, the possibility of a truthfully described past has been devoured by ideologies of utter indifference and misguided passion. 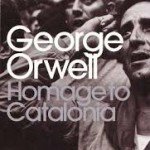 Re-reading Orwell’s Homage to Catalonia, as I did, in the midst of the bombing of the region of the world known as “the cradle of civilization,” and the subsequent looting of the earliest-known written records of the past, added more than a touch of bitter irony to the experience. At the end of his essay, “Looking Back on the Spanish War,” Orwell remembered the Italian militiaman who appears at the beginning of Homage to Catalonia, and he appends a few verses written in memory of that young man. The poem is conventionally sentimental and not especially memorable except for its concluding phrase, in which the generally pessimistic Orwell allows himself to briefly imagine that “No bomb that ever burst / Shatters the crystal spirit.” But in Orwell’s truer imaginings, in his nightmare, the point is that even “the crystal spirit” is shattered.